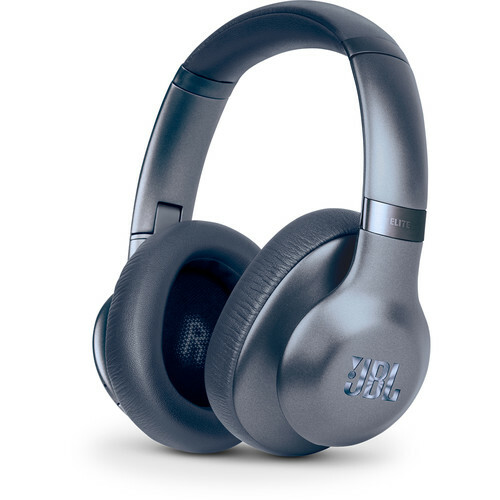 Enjoy an audio experience tailored specifically to you with the blue Everest Elite 750NC Wireless Headphones from JBL. These headphones feature dual 40mm drivers, which help deliver JBL's signature sound quality. The 750NC connects to your mobile device using Bluetooth 4.0, enabling you to stream audio wirelessly. You can also enjoy a wired audio experience with the included 3.5mm cable. In addition to music playback, the 750NC features an integrated, echo-cancelling microphone that allows you to make and receive hands-free calls. The Everest 750NC's built-in rechargeable battery lasts for up to 20 hours and can be fully recharged in only 3 hours. A charging cable, audio cable, and carrying case are all included. The Everest Elite 750NC's built-in battery provides 20 hours of playback in wireless mode, with full recharge in just 3 hours. Tune out the world with adaptive noise-canceling technology that lets you control the level of ambient noise you want to let in or block out. Calibration personalizes the audio performance based on earcup fit, delivering an authentic version of your music. A built-in microphone with echo-cancellation technology enables clear, hands-free calls. An ergonomically-designed fit matches the unique contour of listeners' ears for an always-comfortable audio experience. A sleek flat-fold design and premium carrying case deliver easy portability and enhanced protection. Easily update your headphones over the air via the My JBL Headphones app so you'll always have the latest features. Box Dimensions (LxWxH) 8.9 x 8.4 x 2.8"
Everest Elite 750NC Over-Ear Wireless Headphones (Blue) is rated 3.8 out of 5 by 74. Rated 5 out of 5 by wags from Best Headphones Purchased these headphones so my wife could keep her hearing. They are working wonderfully. The best headphones I have owned to this point. Im trying to buy a longer audio cable for my headset. Today i bought a standard 3.5mm cable only to find out it was too big to fit into the headset. What size jack should i be shopping for?? The EVEREST ELITE 750NC utilizes a 2.5mm to 3.5mm audio cable for a wired connection. Is it even possible to add AAC or APTX support to the headphone with software update? It may be a limitation of the chipset. I can hear the difference between SBC and APTX-HD or AAC encoding, bummer JBL doesn't offer these advanced codecs because I love the other features of the headphone. No other manufacturer lets you define an EQ that sticks with the DAC of the headset rather than relying on the app! Would it be okay to workout with these headphones on? What is the difference between 710 and 750NC. The distinctive difference between the two other than the Noise Cancellation feature of the EVEREST ELITE 700 is that the My JBL Headphones app is available for use in the EVEREST ELITE 750. This application can be downloaded through the Apple App Store and Google Play on Android devices. This application that gives you access to noise cancellation and ambient aware settings, Trunote&trade; Auto Sound Calibration and Custom EQs. how is the flight adapter used and why? The Flight adapter is used when riding Airplanes since the plugs being used on the airplane is different from a normal 3.5mm jack. What is the Db reduction that these are capable of? Are the suitable for high noise environments? There is no exact DB that these headphones can actually cancel. But I am sure that this is suitable for high noise environments. Hi! Unfortunately, the Everest Elite 750 does not have the dedicated Siri/Google Assistant button.